Four steel-framed buildings in the Time Square mixed-use scheme are helping to regenerate a large swathe of Warrington town centre. Warrington is perhaps best known for its Rugby League team, the Wolves, one of the founding members of the Northern Rugby Football Union in 1895 and the only one that has played every subsequent season in the top flight. However, the town has plans to become a retail and leisure destination, no mean feat when you consider the proximity of Liverpool and Manchester, both of which are only 20 miles away. The town already has a major draw card in the shape of its award-winning market that dates back to medieval times, and which was recently voted the nation’s best small indoor market. It is currently housed in a temporary building, erected so that the original structure could be demolished to make room for a brand-new hall. The new market hall forms one part of the new Time Square development, a £110M mixed-use scheme, which will eventually help Warrington Borough Council realise its plans to regenerate a large swathe of the town centre. 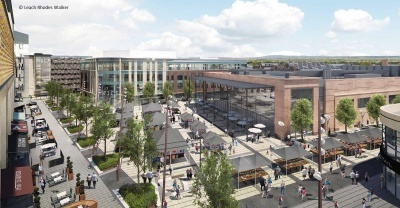 Overall, the Time Square development consists of four steel-framed buildings, a leisure block accommodating retail and restaurant outlets on the ground floor and a 13-screen cinema complex above, a four-storey 9,200m2 council office, a two-storey retail block and the new 60m × 40m market hall. Steelwork contractor James Killelea has erected 3,000t of steel for the project, a total which equates to more than 6,500 individual pieces. The upper floors have all been formed compositely, with steel beams supporting metal decking and a concrete topping. The steel erection programme began with the leisure block, as main contractor Vinci Construction continued with site remediation on the remainder of the site. The leisure block measures 95m × 55m and has a height of 28m. 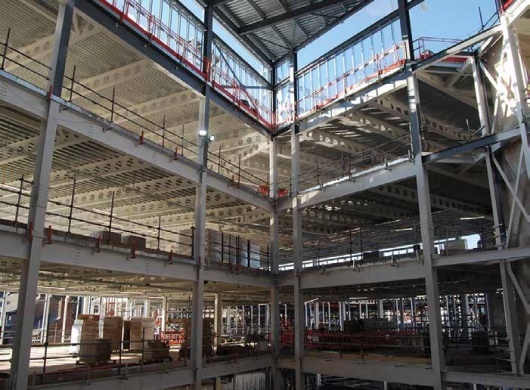 The ground floor, which will accommodate retail and restaurant units, is a double-height space with plenty of room for optional mezzanine levels. A complex steel design has been utilised in the leisure block as the ground floor column pattern does not fit well with the upper level’s cinema. The retail units are typically 10m-wide × 35m-deep clear spaces with no internal columns. To the rear of these units there is another column-free space accommodating a service yard, while numerous service areas and connecting corridors further limit the opportunity for column positions. The cinema design incorporates a central spine of three floors to provide access and projection levels, while storey-high trusses have been used to transfer load to available support positions and limit beam depths where there is a restricted height. The 13 screens vary in size, adding to the steelwork’s complexity, while each one had to be acoustically isolated. A number of design measures were undertaken to make sure the screens were adequately isolated. The building is a large braced frame, gaining its stability from bracing located around lifts shafts and stair cores and in the roof. The latter bracing elements could not use hollow sections as these members are not suitable for acoustics. Also, in the structure’s roof the purlins had to sit on half cleats to prevent sound travelling between the screens at this high level, while all of the building’s column splices have used countersunk bolts to create a flush surface to aid the installation of acoustic boards. “We also formed joints in the concrete slabs beneath the acoustic walls to prevent sound traveling through the floors,” adds Mr Murphy. 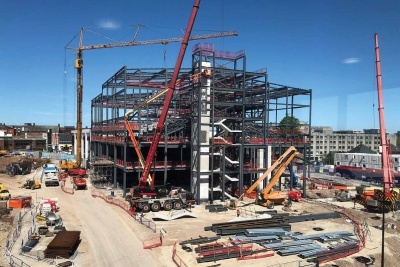 Once the 1,600t of steelwork for the leisure block had been completed, the remediation and ground works had also been concluded and James Killelea’s erection team were able to move across the site and begin work on the offices, market hall and the small 61m × 18m retail block. The four-storey office building is a skewed horseshoe shape in plan, with a centrally-positioned full-height atrium. It is approximately 72m-long and will offer 9,200m2 of floorspace. Using braced cores for its stability, the office has been designed for maximum internal column-free space and features 15m spans throughout. All of these long spans have been formed with Westok cellular beams that also accommodate all of the building’s services within their depth. A service yard sits below one area of the office, adjacent to the entrance of the basement level that covers the entire footprint of the adjacent market hall. 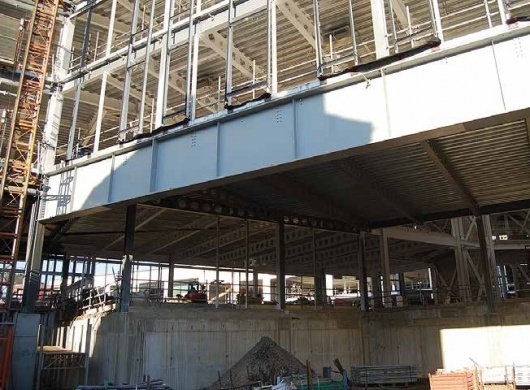 A 22.5m-long × 1.8m-deep plate girder forms the column-free space and supports four-storeys of office structure above. This one steel member represents the largest single steel element on the entire project. A retained Victorian façade has been incorporated into the design of the new market hall, along its main Bridge Street elevation. The façade previously belonged to a Boots store and formerly accommodated a plaque remembering the tragic IRA bombings which occurred on the spot in March 1993. The plaque has been temporarily removed by Vinci and will be returned to its location once the scheme is complete. The retained façade was temporarily supported by a scaffold system, which was systematically released once the connected market hall steel frame was completed. The market hall measures 60m × 40m and features first floor mezzanine levels around two sides, while the central column-free area of the structure is formed by a series of 27m-long lattice trusses. The roof trusses also support a feature roof light that will allow natural light to penetrate the inner parts of the hall. 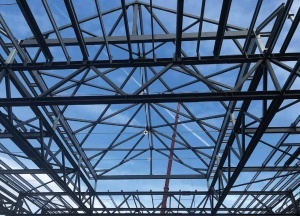 This structure is a braced frame that makes use of Macalloy cross bracing, which will be left exposed within the completed building as architectural features. Time Square is scheduled to open in early 2020.